Truth Before Dishonor has provided multiple articles following the tax-and-regulate schemes of Illinois and California, and the resultant business and people flight away from those Leftist-run states to far more tax-friendly states. We have also shown how the tax-friendly states have been far more economically successful than the Leftist tax-heavy states, in an article Le-gal In-sur-rec-tion named “Post of the Day”. We noted that Illinois’ Democrats — in a move showing even they know that tax increases are economically harmful — provided a major corporation with a 100 million dollar tax credit in order to keep the corporation in the state. Now, from Hot Air comes the news about Maryland’s own tax-payer flight from high taxes. Yes, Maryland created a confiscatory “millionaire surtax” and, surprise of surprises, Maryland’s wealthy fled the state to places like income tax-free Florida. So, the “soak the rich” tax increase caused Maryland to lose tax revenue in huge chunks. Their decision to raise tax rates on the productive caused them to lose tax dollars in the coffers! Just like we TEA Party commonsense Constitutional Conservatives declared would be the case! Imagine that. In other economic news, the 17 states that elected Republican Governors in 2010 all saw their unemployment rates drop, and at a faster aggregate rate than the nation as a whole, while the Democrat side cannot say the same thing. “Unexpected” by the “expert” economists, I’m sure. It’s very clear which side is the more economically and budgetarily successful, so if you’re interested in improving our nation’s economic condition or budget condition, there is only one Party for which to vote. And they ain’t the donkeys. Moving From California To Texas? You’re not alone. For several years, California businesses have pulled up stakes and moved to Texas. Here are a couple quick videos featuring Andrew Puzder, CEO of CKE restaurants (that’s Carls Jr, and Hardees), a multi-billion-dollar business that moved from California to Texas, very briefly touching on some of the reason why. 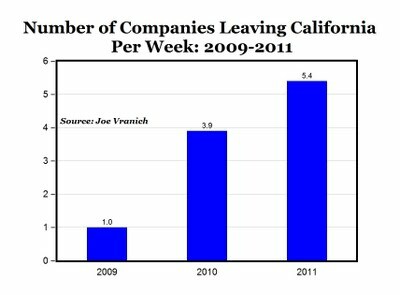 As I said, the business exodus from California has been ongoing for several years. Here is a video from mid-October, 2010, noting that over 150 businesses had fled California up to that point in 2010 alone, and that it was a continuing occurrence and not the start of the flight. A business that spent 42 years in Orange County, California, moved to Corpus Christi, Texas in 2011. The main reason cited? Taxes and fees. The businessman’s Texas building has double the square footage at a quarter of the cost. His corporate truck registration fee is 1/7 the cost it was in California. His electric bill while running the air conditioning for a full month in Texas is less than 1/3 the average bill in California. California charges sales tax on leased equipment, unlike most states. Every month of the lease, there’s another month of sales tax. When California residents put a cap on property tax increases, California Government officials just switched to skyrocketing fees, such as Orange County’s sewer connection fee, which went from 50 a year to 800 a year, a 16-fold increase. In the same time-period, his fee for a business license nearly doubled. In other words, California made it far too expensive to remain. Do read the above-linked article. Why do these and the other companies move out of California? Vranich has updated his top 10 reasons that California companies call the moving van. No. 10 is new: Energy costs soaring because of new laws and regulations. Commercial electrical rates are already 50% higher than the rest of the country, Vranich says, and Gov. Jerry Brown just signed a new law increasing the amount of power utilities must buy from renewable sources plus regulations for the California Global Warming Solutions Act will start soon. 1. Poor rankings for California on lists ranging from taxes to crime rates to school dropout rates. “There is little evidence that California’s business environment will improve considering that the legislature in 2011 has voted down litigation reform, tax-increase plans are underway, and a host of new regulations are to be implemented that will increase costs for literally every business,” Vranich says. California is shedding business because California is making it increasingly cost prohibitive to operate a business within its borders. And that means California, a very high-tax state, is losing massive amounts of tax revenue — and jobs. All while California continues to profligately spend money like there’s no tomorrow. California Legislators and other government officials even came down here to Texas to find out how Texas is luring businesses away from California. The contrast is undeniable. Texas has added 165,000 jobs during the last three years while California has lost 1.2 million. California’s jobless rate is 12% compared to 8% in Texas. “I don’t see this as a partisan issue,” Mr. Newsom told reporters before the group met with Texas Republican Gov. Rick Perry. The former San Francisco mayor has many philosophical disagreements with Mr. Perry, but he admitted he was “sick and tired” of hearing about the governor’s success luring businesses to Texas. And, of course, businesses aren’t all that’s fleeing the People’s Republik of Kalifornia. People are, too. While New York, California, and Illinois all have very high income tax rates, Florida and Texas have no income tax. 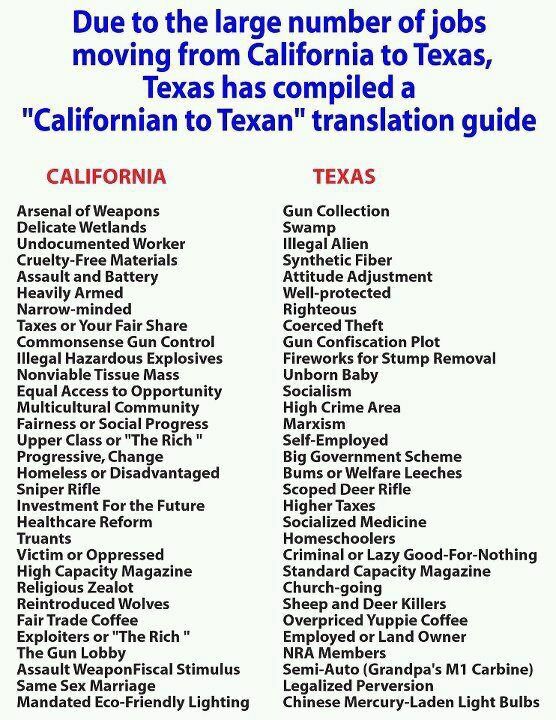 For those of you moving from California to Texas (really from any Leftist state to Texas), The Grouch at Right Truth has a little language translation aid for you. California passed a stupid law requiring 1/3 of its energy usage be “green” energy and Beers with Demo has some crazy numbers to show the stupidity of the law. 129 square miles of solar energy fields and 1800 square miles of wind energy fields. Or basically a 13-mile by 10-mile field of solar panels and a 45-mile by 40-mile field of windmills. But you can’t do that because the tortoises won’t let you. And then you have all the power transmission lines. And the megatons of steel (which would invariably be bought from Communist China). And the scarce rare earth elements which also come from Communist China. But don’t worry none, Californians. You won’t need eyesores of that size in your desert. The Liberals are driving business out of California at a very high rate, so undoubtedly your energy usage will drop. Thus, the need for these massive fields will also drop. The Progressives at work, making Entropy progress far more rapidly. … and promptly loses income to tax. They were warned this would be the result. Why didn’t they listen? Going Galt: the new vogue. PT Barnum is famous for using “The Great Egress” as a way to get people to leave his side-show tents. People didn’t know that “egress” means “exit” so they would go on to see the great egress for themselves. Well, California is having its own Great Egress, and they’re not the only ones. As I wrote in Voting With Their Feet (With Charts), major US Cities with decades-long Liberal rule have had their citizens running for the exits for decades. California is no different, except California replaces them with illegal aliens. What’s hurting California is the mass business flight. Mark Perry at DailyMarkets.com has the story. California currently ranks #49 among U.S. states for “business tax climate” (Tax Foundation [pdf]) and #48 for for “economic freedom” (Mercatus). It shouldn’t be any surprise then that companies are leaving the “Golden State” in record numbers this year (see chart above) for “golder pastures” and more business-friendly climates in other states. The top five destinations are (1) Texas, (2) Arizona, (3) Colorado, (4) Nevada and Utah tied; and (5) Virginia and North Carolina tied. So, people flee Leftist rule. Businesses flee Leftist rule for much more Conservative, people-friendly and business-friendly states. And the Leftists cannot figure it out. The way it is and has been since the beginning of time isn’t the way it “should be” according to them. Earth to Liberals: If you provide a welcoming environment, they will come; if you provide an antagonistic environment, they will flee. I strongly encourage all worthwhile businesses to flee California and move to business-friendly states like Texas. But if you’re a Liberal, please stay in California. Your viewpoint and positions created the Califonia mess and you need to live in it. We don’t want you destroying Texas like you destroyed California.